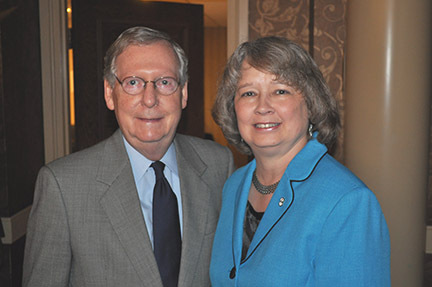 Senate Majority Leader Mitch McConnell (R-Ky.) and NRLC President Carol Tobias. It was the last NRL News Today post for Wednesday and went out late. But the announcement by pro-life Senate Majority Leader Mitch McConnell (R-Ky.) that the Senate will bring up the Pain-Capable Unborn Child Protection Act next week was news too important to hold until this morning. “Now Congress has an opportunity to take a step forward. …I’m pleased to have filed cloture on this bill to protect unborn children who are capable of feeling pain. …And I look forward to voting for it early next week,” McConnell said, according to The Hill’s Jordain Carney. You’ll recall that the House passed a similar bill last October by a vote of 237-189. The bill extends federal protections to unborn children who have reached 20 weeks fetal age, a juncture by which medical science has demonstrated they can experience pain. However if 45 years post-Roe teaches us anything, it is that pro-abortionists in the Senate will admit none of this, especially the foundational truth: an unborn baby at this stage of development will experience horrific pain as she is aborted. Thus they will slide around, skip over, and do everything they can to evade what NRLC President Carol Tobias said at a press conference in October when the Pain-Capable Unborn Child Protection Act was formally introduced. It is common to read in articles about this legislation that unborn children do not have the capacity to experience pain at 20 weeks fetal age. Those kinds of claims ignore the facts. There is a large body of evidence that includes testimony from such experts on fetal pain as Professors Kanwaljeet “Sunny” Anand and Colleen Malloy. Dr. Anand does not wish to be drawn into the abortion debate but his testimony stands. The bill has widespread public support and is already the law in sixteen states. This is important for a number of reasons. Enactment in nearly a third of all states, for example, tells anyone with ears to hear and eyes to see that if the federal government passes the bill, it would be in harmony with a growing number of states. Moreover, when opinion polls show 60%+ support for a ban on abortion after 20 weeks (often without even mentioning the reality of fetal pain), clearly the public is deeply troubled by later abortions. We will be told over and over that “Mid- and late-term abortions are already extremely rare, and a common motivation is concern that fetuses are developing with severe abnormalities,” as the Washington Post argued last year in a semi-coherent editorial. This is a talking point straight out of the pro-abortion handbook, a bogus assertion that NRLC has debunked on numerous occasions. Let’s be clear. If there comes a time when it is impossible even for the pro-abortion American College of Obstetricians and Gynecololgist (ACOG) to pretend babies at 20 weeks fetal age do not experience pain, does anyone think the Post would suddenly embrace this “clear scientific standard”? Of course not. If in the meanwhile the “consensus” became that the unborn child experiences fetal pain at 24 weeks fetal age, would the Post change its tune? That “clear scientific standard” would be just as unacceptable. Again thanks to Senate Majority Leader McConnell and to pro-life President Donald Trump for his strong support for the Pain-Capable Unborn Child Protection Act. How many botched cases will it take to end euthanasia of the mentally ill?